Helen Bitner's late husband Ryszard Bitner-Glindzicz was born in Kwatery, situated between Swisłocz and Brzostowica. He left some tapes and notes about his life and his wife Helen has just finished writing about his experiences. The family shared the fate of hundreds of thousands of Polish families from Eastern Poland - Kresy - and is described more fully in Helen's complete account. In short, they were deported to Kazakhstan to work on a collective farm. Following Hitler's attack on the USSR in June 1941they were allowed to join the Polish army being formed in the USSR under the command of gen. Władysław Anders and left the USSR with the army to fight alongside the Western allies in the Middle East and Italy. The story recounted here covers with their arrival in the U.K. and the first steps towards integration into the British community. 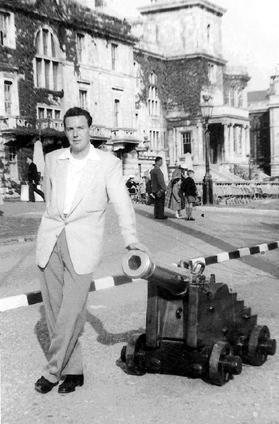 On a damp, overcast morning in late August 1947,Richard and Janusz arrived in Southampton. They came on the ‘CHITRAL’ a converted cargo vessel which had been used as a troop carrier during the war. At the end of the journey, Richard (Ryś) was feeling quite wealthy, as he had found himself a job as a ‘look out’ for a poker school run by some of the young soldiers on board. Janusz was not happy about his brother’s job but there was nothing much he could do about it because Ryś, as a matter of pride, totally ignored all advice from his older brother. Marynia their mother was still at Camp Barbara and would join them within the next week. In any case, by the time the ship reached port, Rys was a skilled poker player. He wasn’t allowed to join in any of the games, but watching was most informative and he learned such a lot that he would put to good use later on. The new arrivals were taken by train to Brandon in Norfolk and then by army lorries to Bodney Airfield Camp No. 2, where Rys entered the first form of the Cadet Secondary Grammar School. Britain was still on rations, and food was anything but plentiful; fortunately Rys continued to like the dry yellow fruitcake, which seemed to be freely available in the camp canteen. I don’t think anyone else wanted it, which is why it was so plentiful. Within a few months of arrival at Bodney, the cadet school was demilitarized, under the regulations of Bevan’s Resettlement Corpse, which was specially set up to dispose of any further responsibility for the Polish Forces in Britain. 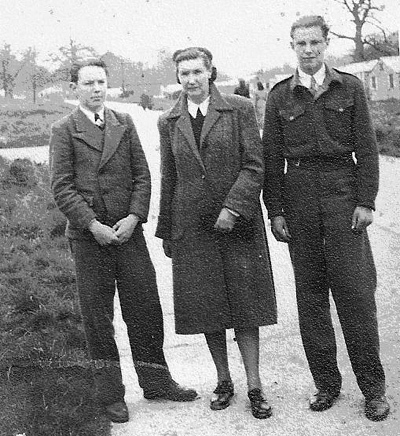 Marynia and the boys were demobbed and the family were transferred to Foxley Camp in North Herefordshire in mid December 1947. Krystyna and her mother were still fellow travellers and the Letowski family kept in contact but they soon moved out to Meltom Mowbray shortly after arrival. Those women who were reunited with their husbands, and the children who still had fathers were among the more fortunate. Foxley Camp was situated in the country, miles from the nearest town. It had been an American Military Hospital located in the park of a stately home but the people were housed in barracks. Arranged in neat rows, each barrack had a living room, a kitchen and two bedrooms. There was a stove with a pipe to the roof and outside the front door each hut had a coalbunker. The front of the huts had brick facing and some people built porches to give them more space and at the same time act as wind breaks. Later, nice little gardens were dug, mostly given over to vegetable growing. There was a church and soon a social club was set up, and Polish dancing and music evenings were organized. Even if the accommodation was fairly low grade, it was not the worst the families had had to live in and there was a determination to get out into the wider community and work. However, many young families lived there for a number of years, as housing in England was in short supply after the war. In addition, it was not always easy to get suitable work because of a Trade Union embargo on employing Poles, regardless of their professional qualifications and skills. The only jobs on offer were for unskilled labourers. In the late forties and fifties, it was not unusual in London to have generals as waiters and colonels as hotel doormen or even dishwashers. Indeed, some of Marynia’s friends were just in that position, including Colonel Borycki. Marynia’s ambition was to move to London as soon as she had the opportunity, and some of her friends including Krystyna and her mother planned to move there too. However, Rys had to be settled at school first. It was particularly hard for Marynia having to make all the decisions herself. Her English was just basic, although she was fluent in French and Russian and had passable German. Janusz was now 17, and despite Marynia’s best endeavours, she could not get him to continue his education. He simply refused, and set about getting himself a job - any job. 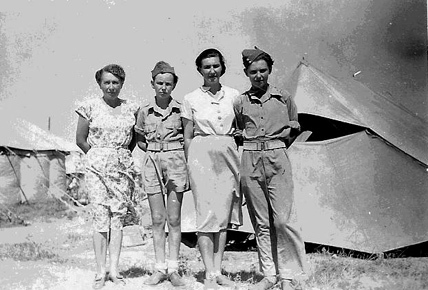 The family’s first Christmas in England was spent in Foxley camp where Richard met Marynia’s younger sister, Aunt Helena, and her husband Zbigniew. Both had been officers in the Polish Army. Helena was one of the very few officers who had been commissioned on the field of battle, and Rys felt rightly proud to have such an aunt. Straight away, she and Rys felt at home in each other’s company and she was also a support to Marynia and was to become a great help and peace maker in liaising between Marynia and Richard when the latter got into hot water at school. Rys felt that Aunt Helena understood his side of the story and she wasn’t as emotional about things as his mother. Aunt Zosia Guminska, another of Marynia’s sisters had been more fortunate than other members of the family. Her husband had been working in Switzerland when the war started, and he and his family were able to move to England where he obtained a post as a lecturer at one of the London colleges and Zosia, who was fluent in English, was employed as a secretary. 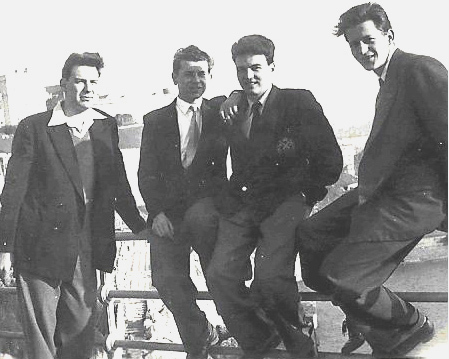 In the January of 1948, Richard arrived at his new civilian secondary school, the Nicholas Coprenicus Grammar School in Riddlesworth, Norfolk. Once again, barbed wire fencing surrounded the perimeter and all the school dormitories and classrooms were in Nissan huts with concrete floors. The offices, teashop (always called the NAFFI), the dining rooms and kitchens were located in more permanent buildings. Each dormitory had a stove but it was always cold and the boys had to collect wood from the local woods to keep warm in what was the first English winter for many of the arrivals from the Middle East. It was a tough environment for young boys and the army discipline was carried over from the cadet school and established as the order of the day. In Richard ‘s first term there were a number of older boys in his form, some of whom felt it necessary to exert their authority. Richard said he learned to work out strategies of survival at Riddlesworth. Rule number one was to ignore petty teasing and appear unconcerned about nick names. His nick name was Cigaro because he was a confirmed smoker at fifteen having picked up the habit in Barbara. He didn’t like the name but always smiled when it was used and after a bit no one bothered. The other thing he refused to tolerate was bullying and always confronted threats there and then. In this respect he was fortunate as he was much taller than average standing over 6ft. at fifteen. When Rys stood up straight, stuck out his chin and narrowed his eyes, very few people wanted to mess with him. Nevertheless, he did have a few scars, so there were undoubtedly some physical scrapes, but nothing serious. Usually, his biggest problems were shortage of food and lack of money. Meal portions were often too small for Rys and he had a policy of sitting beside people who had poor appetites. One boy in particular Tony Zak, seemed never to finish his meal and always passed on his leftovers to Rys. Sitting together for most meals, they became very good friends and remained so right through school, college and beyond. Because he smoked, and cigarettes were expensive at five pence each for a Woodbine, he was always broke. Often, his monthly pocket money would have disappeared by the third week, or even earlier. On his return to Foxley for the summer holidays, Richard got himself a job on a nearby farm. The work - potato picking - was literally back breaking labour and it only paid a pittance. Nevertheless, it was better than being broke and he would have dearly loved to save enough to buy a second hand bike but he accepted that chances of that happening were slim indeed. One or two boys at school had bikes and occasionally they hired them out. Already, Rys had to part with some very good stamps from his collection for a ride out on a bike, but he fully understood that anything he wanted he would have to pay for it. Throughout his life his favourite expression was ‘There are no free lunches’. A lesson learned early. After working on the farm for a few weeks, Marynia moved the family to London where they rented a single room, a short walk from Fulham Broadway Underground Station. Rys’s next job was dish washing at Lyons Corner House in Piccadilly and the pay was only marginally better than that at the farm. He had to rise at dawn and queue up every morning to ensure he would be picked from the line outside the side door of the restaurant. Any later than 6am and the jobs would have been taken already. One Saturday he was at the Corner House later than usual and the jobs were all taken before he reached the head of the line. He had been chatting to another Polish chap in the same boat as himself and the conversation turned to football. When neither got a job for the day, they decided to go to watch Arsenal play that afternoon. From that time on, Rys remained an ardent Arsenal fan. He enjoyed watching Chelsea and Fulham play too, but his loyalty remained firmly with Arsenal. Janusz and Marynia also got employment. Marynia worked as a chambermaid in a hotel in Kensington. Her English had little chance to improve since her arrival, but her employers were Polish as were all her friends and connections in London. The living space in the flat in Fulham was impossible and they moved to another slightly bigger place in Earl’s Court. The new flat was just a short walk from the Warwick Road entrance of the tube station. For the last few weeks of the summer holidays Rys got himself a much better paying job on a mushroom farm, just a stone’s throw from London Bridge. But the work was the pits. It was dirty, smelly and soul destroying. Possibly, it was the worst job he had ever had, or was likely to have, but he needed the money, and whatever he earned, a significant portion of it was given to Marynia. He continued to give his mother, and later his grandmother, an allowance throughout their lives. In September 1948, Rys returned to school, which had moved to Elough Camp near Beccles in Suffolk. As in the other camps the classes and dormitories were in Nissan huts, but by January 1949 the school had moved to Bottisham near Cambridge where it remained until early July 1952. The school at Bottisham was in the park of a stately home and the grounds were spacious but the various school buildings (Nissan huts again) were badly arranged and the boys were forever walking from one place to another, from the dormitories to the classrooms from the classrooms to the library, from the library to the dining rooms and from there to the sports fields on another site further away yet again. But unlike the other places, this time the school was on the edge of a sizeable village and the convenience of a post office, a fish and chip shop and the usual drapery and hardware shops made a great difference to the boys’ lives. The only complaint Rys ever voiced was that he shared the dormitory with a young man who believed he had a wonderful tenor voice and he tended to spend his spare time exercising his talent. Someone singing Nessum Dorma, repeatedly and often, was not destined to become popular, and to make matters worse, he was not the great tenor he thought he was. Even the rude comments of his class mates did not dent his love of singing and the pleasure he derived from listening to his own voice. For the first few years at the secondary school Rys did very little studying, just skimming the surface of every subject, playing poker, [which was strictly forbidden by the powers above] and sneaking off into the village. He enjoyed sports, playing chess, history and listening to music [not his dorm mate’s] whenever he got the opportunity. Marynia tried to get through to him the difference between having a job and having a career. She had to visit the school more than once, after receiving particularly bad end of term reports. His two worst subjects were English and maths. There was nothing much Marynia could do about his English but she got him a tutor for maths and insisted he study over the summer holidays. However, he always had to work too, and if nothing better turned up he stood in line outside Lyons Corner House at 6 am. Towards the end of the lower sixth form, Richard’s English was still poor, but he came to really enjoy maths and consequently became a good mathematician. Unfortunately, his reputation as a slacker was hard to live down and when he produced good work his teachers suspected he had copied from other boys. Once, when he was reading in the dorm, the maths teacher walked in and asked ‘Who did you get to do this work for you Bitner?’ pointing to the last homework. Before Rys could answer, a boy, on overhearing, promptly chirped up ‘Sir, Bitner is one of the best at maths in the class. He helps us. He even solves maths problems as a hobby. Look at his rough book.’ That was quit gratifying for Rys but it was hard to get a good report when he had spent every single Saturday afternoon of the previous term on punishment duties. His reputation landed him in trouble with other people outside school too. On the last Friday of each month, Marynia sent Rys a postal order for ten shillings (50p to-day). This money had to cover his cigarettes, or probably tobacco and papers, plus the occasional visit to the cinema. The price of the fare home at the end of each term was sent separately, usually a few days before departure. One time, the end of term fare money did not arrive by the last day of term and Rys had to borrow from the only boy who ever had surplus money. Most of his classmates were in a similar financial position as himself. The lender was also a stamp collector and so Rys had to part with some more of his precious collection. It was a hard thing he had to do here, but he managed to scratch together enough for the rail fare. He decided he would ask his uncle, Jan Guminski, for the bus fare, once he arrived in London. The bus would only have cost about 4p at the time. When he reached the Guminski house and asked to borrow the fare because his postal order had not arrived on time, he was told ‘No. You can just walk home. I don’t believe a word you’re saying’. Rys knew he hadn’t always worked as hard as he should at his school work, and that he often disregarded his mother’s advice or suggestions, and that he and Janusz squabbled, but he never lied and he never stole. As he walked across London, the seven miles to Earls Court, he felt keenly the injustice of such an accusation. In August 1952, Marynia moved to yet another flat in Elsham Road, Holland Park, which was within walking distance of Shepherds Bush Central Line Underground Station. Richard spent his holidays washing dishes in Lyons of Piccadilly during the week but around this time his social life at the weekends was busy. A very good looking 19 year old never lacked invitations and, outside Brompton Oratory every Sunday after mass, he would meet up with the other young lads from school and the girls would have congregated there too. Off they would all go to the Daquis restaurant or a coffee bar in South Kensington, and chat about the social whirl for the following weekend. By September 1952, the school was in Diddington Camp, an ex-Canadian Military Hospital, set once more in the grounds of another stately home. By Richard’s standards to date, the accommodation was superb. Not only was there plenty of space, but this new place offered that luxury of luxuries, indoor lavatories and baths. Although the school was still in Nissan huts, the internal layout was organized as hospital wards, to allow a number of rooms opening off the long corridor of each hut. These rooms were now used as study rooms and accommodated three or sometimes four students. Now, at last, Richard studied in preparation for the forthcoming G.C.E. and his Polish Matriculation in the spring of 1953, and in July of the same year he was informed that he passed both. He was successful in passing Maths, Chemistry, Physics, Polish, English, History and Geography. In addition, he passed Religious Studies in the Polish Matriculation. It was one of the proudest moments of his life to receive the Polish Matric Certificate from the hands of General Wladyslaw Anders in person, the man whom he always acknowledged as having saved his family and thousands of others when he took them with the Polish Army out of Soviet Russia. The school had encouraged the students to continue to higher education and there was strong pressure from the British Ministry Of Education to apply for places in the technical and engineering fields. Previously, very few boys were given grants outside these areas of study. Rys, for example, would have much preferred to study history but he decided to be practical and choose engineering as a safer option. He applied to three Technical Colleges (all now universities) namely, Huddersfield, Portsmouth, and Plymouth. The first two gave him conditional offers depending on his exam results, but Plymouth offered him a place straight off, without even waiting for the exam results, on the strength of the interview only. The latter he accepted because it was certain. What he called a sure thing.